Top Reasons People Choose Veneers Is periodontal disease contagious? Mouthwash is important for more than just keeping your breath fresh and smelling great. Combined with other forms of dental hygiene, it can help prevent plaque, cavities, gingivitis, and other gum diseases. But it may be difficult for you to choose the right mouthwash off the shelf. Dr. Philip Friedman and our team at Dr. Friedman, DDS wanted to share a few things to look for when choosing a mouthwash. 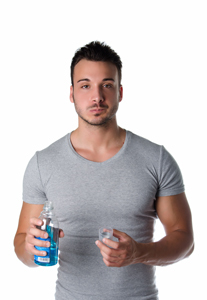 Antibacterial mouthwashes have chemicals to help fight gum disease and other infections. Most mouthwash products contain at least trace amounts of these antibacterials; however, some mouthwashes are made specifically to fight bacterial infections. Remember that mouthwash is prevention, not a cure, so if you are presently suffering from a bacterial infection, you should visit our Savannah, GA office right away. Dr. Philip Friedman may be able to recommend a more powerful antibacterial mouthwash that can help you reduce your pain and other symptoms.